–Unroll the crescent dough; separate into triangles. Arrange triangles in a circle on a pizza pan with the wide ends toward the center of the pan, overlapping each other. It will look like a large sun with the points hanging half off the pan. There should be a 5 or 6 inch opening in the center. –Spoon the meat mixture evenly onto widest end of each triangle. Bring points of triangles up over filling and tuck under wide ends of dough. (Filling will not be completely covered). –Bake 18-22 minutes or until golden brown. –Shred lettuce, dice tomato, onions, olives, green pepper, and whatever other items you want to put inside. 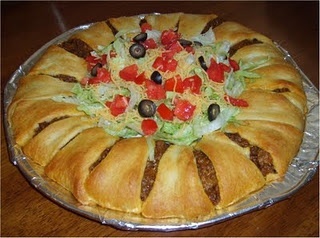 Place them in center of the taco ring and use that as your toppings!